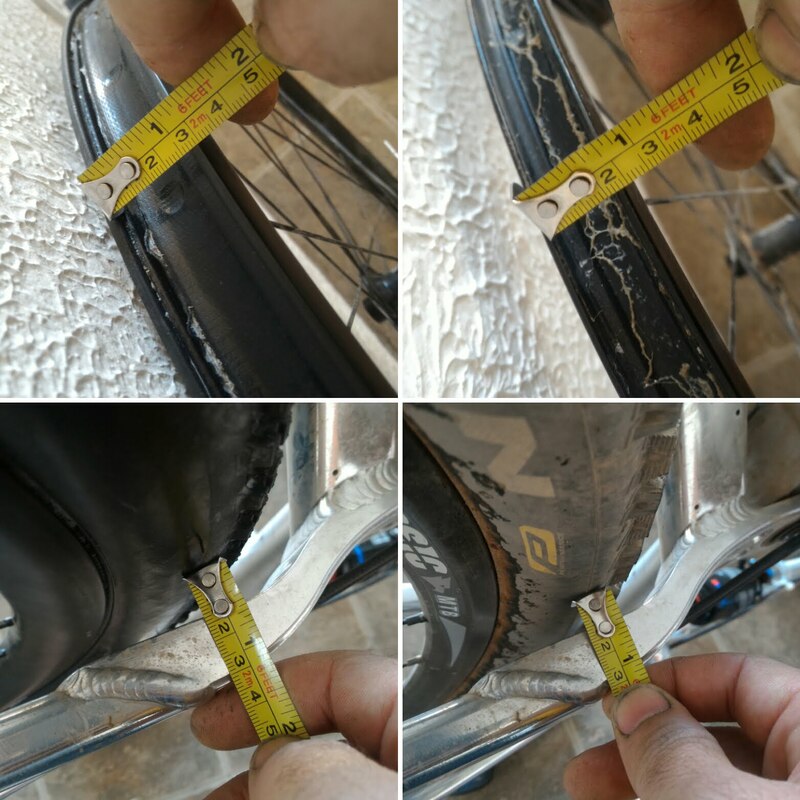 tobias feltus: créateur » Blog Archive » How much does rim width affect tyre width? How much does rim width affect tyre width? I’ve been wanting to move to actual tubeless rims on my MTB for ages. This past year I’ve been riding with a Stan’s No Tubes conversion kit, with the rubber rim strip sitting in my bead. Though this works, it is not ideal as it is still pretty hard to get a tyre to seat properly (I never got my front to seat without a wobble to it), and technically it is not as safe as a true tubeless rim. My front has been a UST tyre, my rear has been a non-tubeless Schwalbe. I’ve gone through two rears. The UST tyre has kept its fluid with little loss, and only one small Stanimal (coral-like creature made by tumbling liquid latex inside a tube for months). My rear just started weeping sealant through the sidewall, as well as loosing large chunks of tread, so it was time. The wheels I’ve been riding on the Yeti are lightweight American Classic MTBs, 17mm wide bead on their older 225 hubs. I was planning on relacing these hubs to new rims, but I was offered a set of carbon rims on Hope Pro Evo2 hubs, so went for that instead. The new rims have 27mm bead seats, which is a significant jump. So how does this affect tyre width? oddly, not much. I would assume that there is some maths involved, but a change in tyre/brand as well as the lack of standards contributes to the fact that I went from a 2.25″ (57mm) tyre to a 2.1″ (52mm) tyre, widened my rim by 10mm and lost 4mm of tyre width, which is reflective of the ETRTO tyre width, and not the rim width. I guess there is a possibility that the width of a tyre will not be affected by the width of the rim, and that the latter only influences the shape of the tyre, but this is utterly counterintuitive. The only attempt at making a tool to calculate how a tyre will fit in a frame on a given wheel was set out in THIS post by Wheel Fanatyk in 2013 and, as far as I am aware, the tool was never produced. Next time I change rear tyre I will stick with Maxxis and try a 2.25″, and it will probably fit the same as the Schwalbe did on the 17mm rim.